BluetoothLogView monitors the activity of Bluetooth devices around you, and maintains a log of all devices that are within reach. Every time a new Bluetooth device enters/leaves your range, a new log line is added that includes the Device Name, Device Address, Event Time, Event Type, Device Type and more. There is an option to add a custom description to each device, making it easier to recognize. You description is saved in a .cfg file and applied each time the device is within range. In other words, this is a simple-to-use yet powerful tool that helps you log the activity of Bluetooth devices (e.g. device name and address) and save the information to HTML file format. 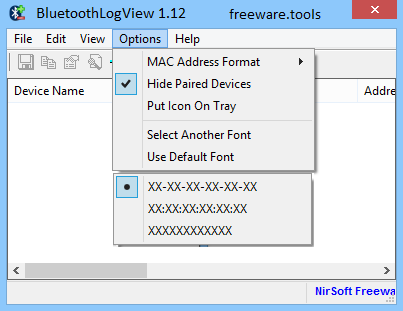 BluetoothLogView is a lightweight software application whose purpose is to help users monitor the activity of Bluetooth devices and display the information in a log. You can copy it on any USB flash drive or other devices, and take it with you whenever you need to log the activity of Bluetooth devices in your area on the breeze, without having to go through installation steps. BluetoothLogView sports a clean and simple interface pointing out to the fact that the accent doesn’t fall upon the looks of the program but rather on its functionality. The program is able to detect when a new Bluetooth device is located in your area and when the device disconnects from your area. It offers detailed information about the Bluetooth activity, such as the device name and address, event time and type (“Device Arrival” or “Device Left”), device type, as well as the company that created the device. What’s more, you can clear the entire log with just one click, use hotkeys for a better control over the entire process, pick the MAC address format, export data to HTML file format, as well as specify a description for every device. It doesn’t eat up a lot of CPU and memory, so the overall performance of the computer is not affected. All in all, BluetoothLogView offers a simple yet powerful software solution for helping you log the activity of Bluetooth devices, and is suitable for all types of users, regardless of their experience level.